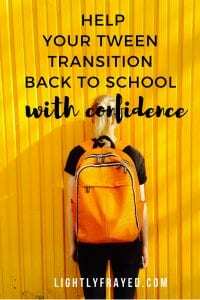 It is possible to help your tween feel less awkward when navigating a sea of firsts: their first day of school, first time at a youth group or first volunteering opportunity. Even the most confident teen can use a little coaching and encouragement. In my attempts to be reassuring, I had actually set him up for disappointment. Soon after, a family friend offered much better wisdom. She encouraged him to be patient and spend time observing other children to decide which friendships he really wanted to pursue. How can we help our tweens feel less awkward with new life experiences? Let’s dive in. Even the word awkward is, well, awkward. Tweens need reassurance that feeling anxious or uncomfortable is common for all of us. Reinforce this by sharing examples of surprisingly awkward people. For instance, when strangers recognized Albert Einstein, he would often say, “Oh yes, people do tell me I look like him,” and then he’d rush away. Also be willing to share your own stories about handling uncomfortable moments, especially humorous ones. What makes it difficult to talk to new people? When have you felt nervous about a situation? How did you push through to eventually feel comfortable? What experiences would you have missed if you hadn’t taken a risk? Talking about anxieties in a relaxed, open way invites further discussion. Feeling inspired so far? 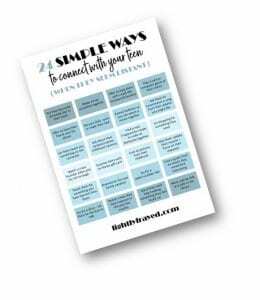 Grab this copy to give you bite-sized, actionable ideas your teen will love. Even the most reluctant tween comes to life when he talks about a topic that interests him. Brainstorm together a few “hooks” that suit his interests and personality. These could include sharing jokes or performing a simple magic trick. Also encourage him to look for opportunities to help others, such as by holding open a door or lending supplies. School friendships can definitely be launched over silly jokes, disappearing coins and borrowed pens. Lunch hours and recess, with wide-open schoolyards and a sea of new faces, are especially intimidating. 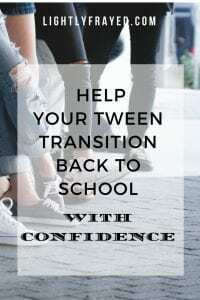 Encourage your tween to invite others to join an activity as a low-key way to connect. Have her pack a few items in advance — a soccer ball or card game — to make her feel more prepared and calm. If your tween feels quite shy or uncomfortable in new situations, be intentional about providing growth opportunities. Nudge her to explore areas she is interested in. Perhaps a photography club, working with animals or volunteering at the library. Support new endeavors by researching opportunities, purchasing supplies and chauffeuring. Also, make your home a welcoming place where other children enjoy spending time. Prepare for friends’ visits with activities that will help everyone relax, such as baking together or a having a board game already set up. 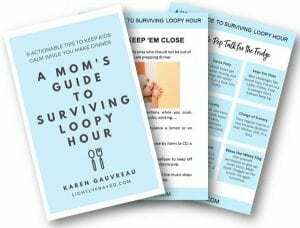 My friend Sarah was a proactive mom who helped her daughter handle significant social anxiety. She regularly invited our family to their house, where her daughter felt most comfortable. 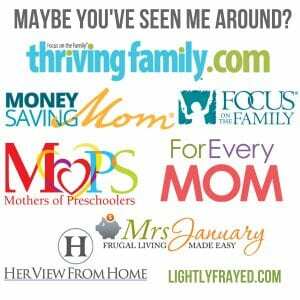 As moms, Sarah and I initially facilitated activities and conversation, and over time we became much less involved in planning the time together. These visits became highlights for all of us, and our children gradually became close, comfortable friends. Being convinced that everyone is watching them can make kids (and adults) feel awkward and uncomfortable. Reassure your child that most tweens are so focused on themselves that they aren’t even paying attention to what others are doing or not doing. This can help alleviate the feeling that he or she is in the spotlight. Also, help your tween shift his focus to others and watch his empathy and social confidence improve. A few years ago I wanted to help my boys be considerate of children who struggle socially. I encouraged them to invite someone over who was often left out My most tentative son, Liam, surprised me by taking up this challenge. We practiced how to extend an invitation over the phone, and his new friend came over the next week. Their time together was a bit bumpy, but it was worth nudging my son out of his comfort zone. These moments remind me of technology’s role in our tweens’ connections. the more we come to depend on the social connectedness offered by our digital world, the more intentional we must be in creating and sustaining real connectedness. To this end, whenever my tweens invite friends over, I often ask everyone to park their devices so they can spend quality time together. Although this may receive protests at first, it is a boundary worth enforcing. Otherwise it’s too easy to default to staring at screens. Taking a pause from technology — phones, screen time, gaming — allows tweens to make eye contact, carry on conversations and negotiate what to do next, all of which are critical skills when developing socially. Navigating through challenging times socially is a natural part of every tween’s growth. It can be tempting to try to remove obstacles from our children’s lives since seeing them struggle socially is difficult. But we empower them best as coaches, cheering as they face their challenges. 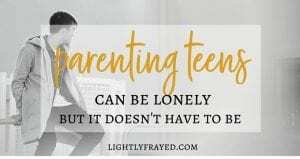 When our tweens and teens successfully push past feeling awkward, they will be more willing to tackle the next challenge, with us proudly cheering from the sidelines. 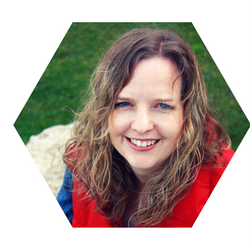 I became a devourer when my kids entered the tween and teen stage. May I offer you more hope for parenting this age group?